Getting started with Google Data Studio is a breeze. You will need to have your google account login handy. Go to datastudio.google.com and login. Make a copy of the “[Sample] Acme Marketing Website” template. Start by changing the data source. Slide the blue slider at the top right to edit mode. Select one or more charts or edit the page settings. Then, below that click “Data”. Next to data source click the right arrow and then the blue button that says “Create New Data Source” . Click one of the data sources such as google analytics. Choose the account view that you want to pull the data from. Click “Connect” then “Add to Report” and confirm. Note: The examples below are made using our template in which we made additional modifications. 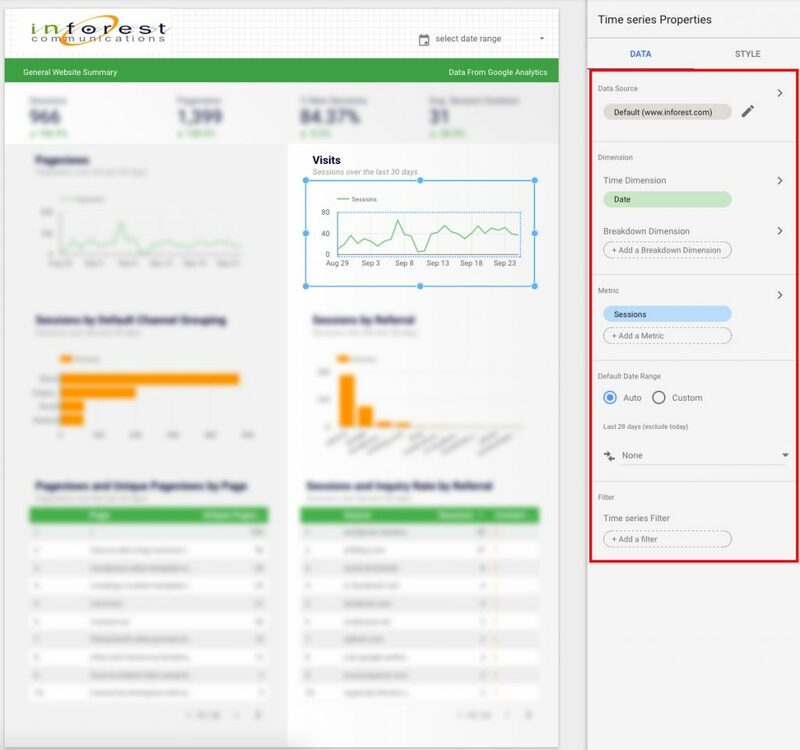 You can now select different components of the report and change the Metrics and Dimensions or add Filters to the components just like in Google Analytics. See the screen shot above. 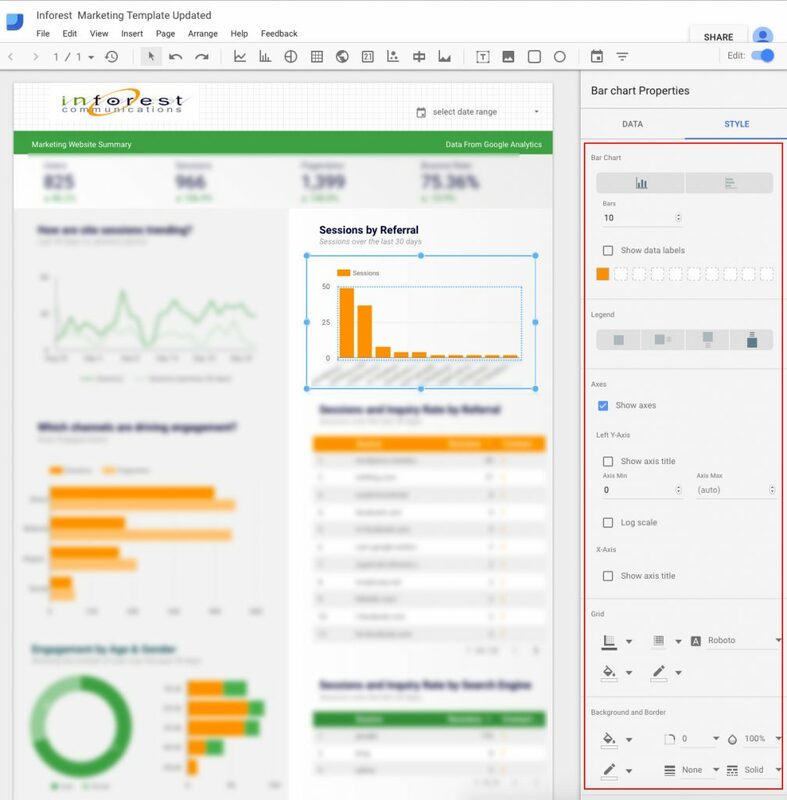 TIP: Login to Google Analytics in a separate window and use your existing dashboards widgets as a guide to create new Data Studio widgets. Now comes for the fancy design stuff. Click any widget and then click style like in the example above. This gives you options to change the colors, orientation and fonts! Tada! You can select and change the title names, colors and fonts. Use the navigation on the top to add custom components, images (logos) and background colors. You drag and drop to move things around. This allows you infinite customization capabilities and the best part is that it is all hooked up to your Google Analytics data. You can also use Adwords, Attribution 360, Cloud SQL, Google Sheets, MySQL and YouTube analytics in your reports. 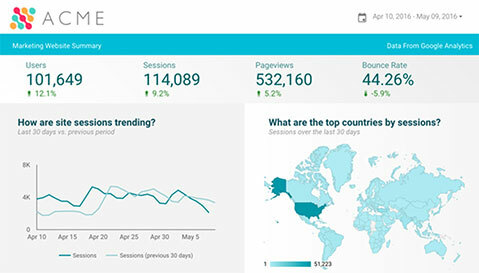 Have fun creating amazing interactive web reports!